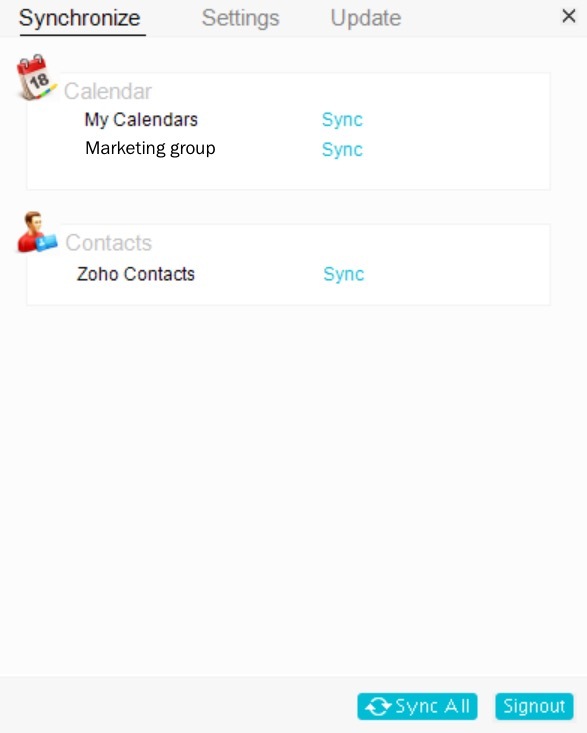 Manage events that are added to the Outlook Calendar on Zoho Calendar and vice-versa using the two-way sync feature. 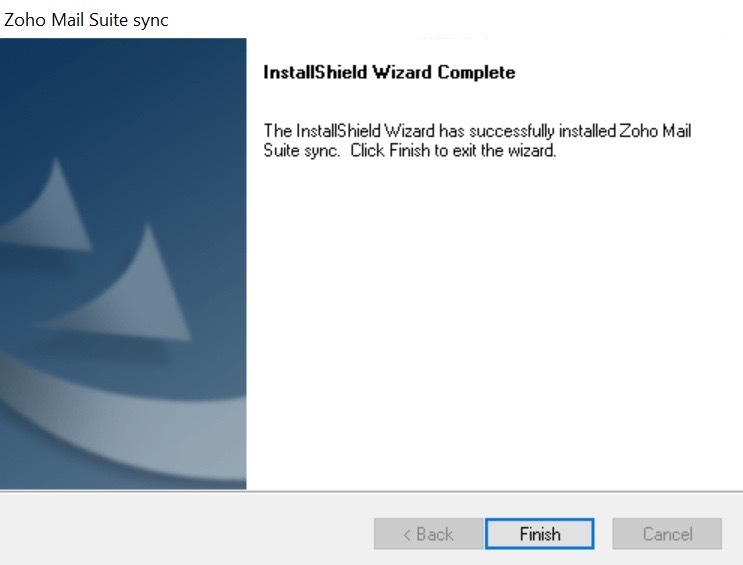 By downloading and installing the Outlook plugin from the Zoho Calendar, all calendar details and contacts will be synchronized two-way between your Outlook and Zoho Calendar. This solves the hassle of shuttling between various calendars by making data accessible on both the platforms at the same time. 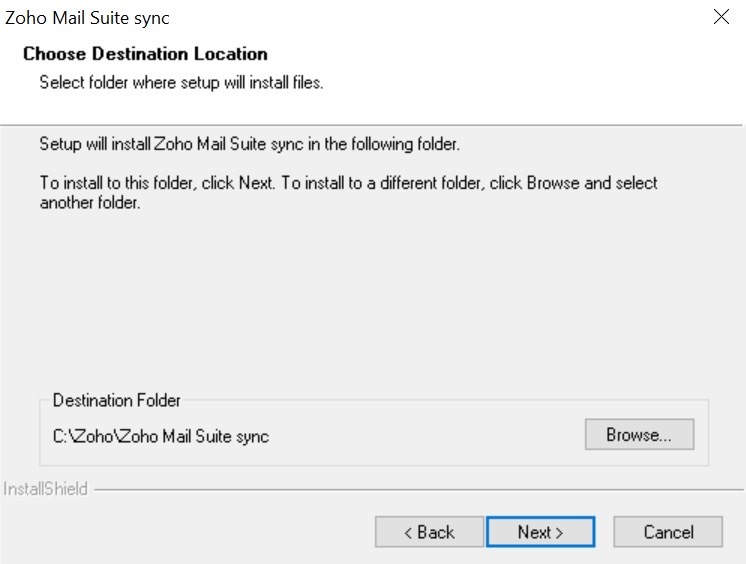 In order to enable the sync between your Outlook Calendar and Zoho Calendar, the Outlook Plugin is required. 1. Login to Zoho Mail and navigate to Calendar. 2. Go to Settings > Calendar > Synchronize > Microsoft Outlook. 3. 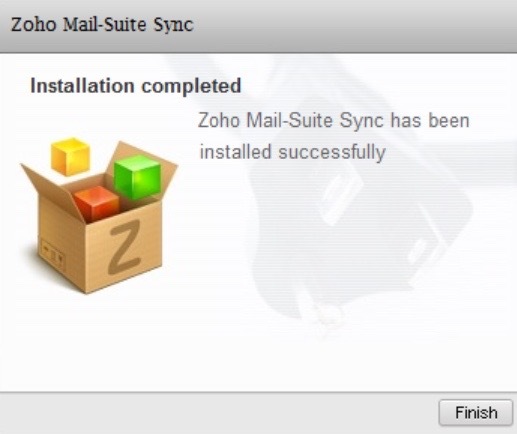 The Zoho Mail Suite Plugin for Calendar Sync is available for both 64-bitand 32-bit systems. 1. Run the Outlook Plugin setup file, downloaded, to run the setup. Use Application-specific Password if Two-Factor Authentication is enabled for your account. 2. Click Next to begin the installation. 3. Click Yes, to agree to the License Agreement. 4. Choose the destination location using the Browse option and click Next. 5. The Installation wizard is complete when you click on Finish. 6. 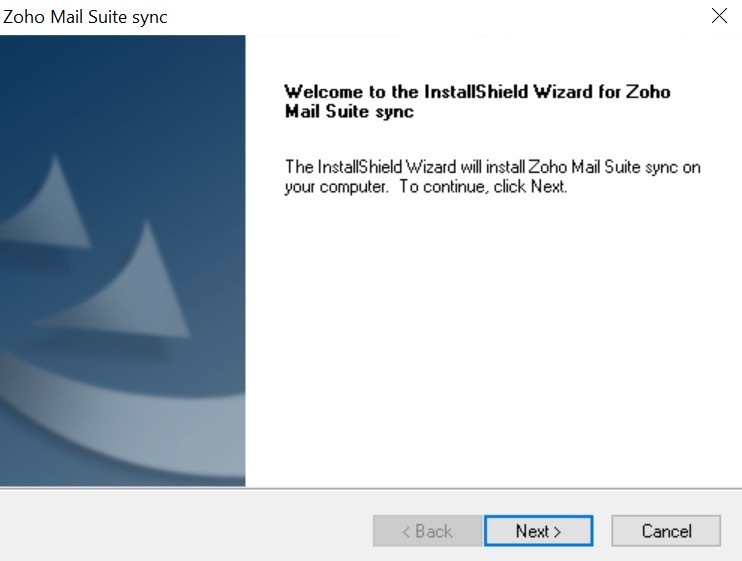 The next Installation window for outlook sync appears. Proceed by clicking Next. 7. The plugin starts checking for compatibility with your Microsoft Outlook version. 8. Click on Finish to complete the process. After installation, when you run the plugin, provide your Zoho account credentials, in the pop-up that appears. 1. Sign-in to your Zoho account using your e-mail IDand password. 2. 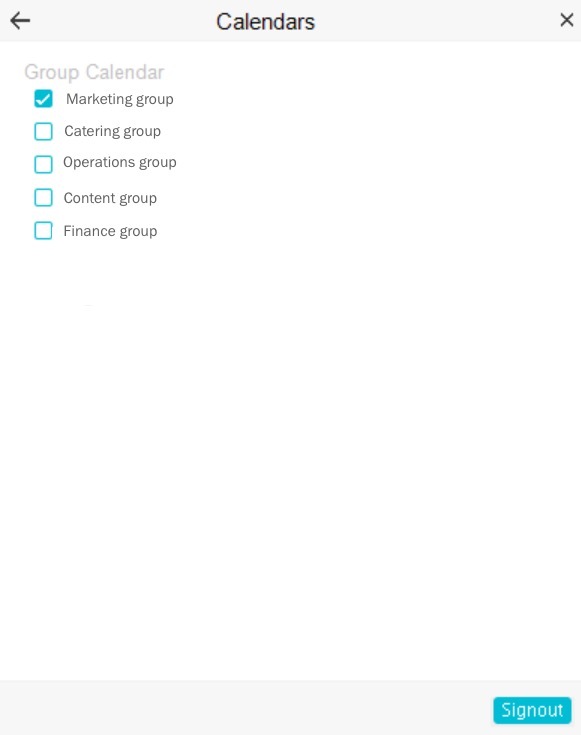 A dialog box appears where you can choose to sync your Calendar and Contacts. 3. 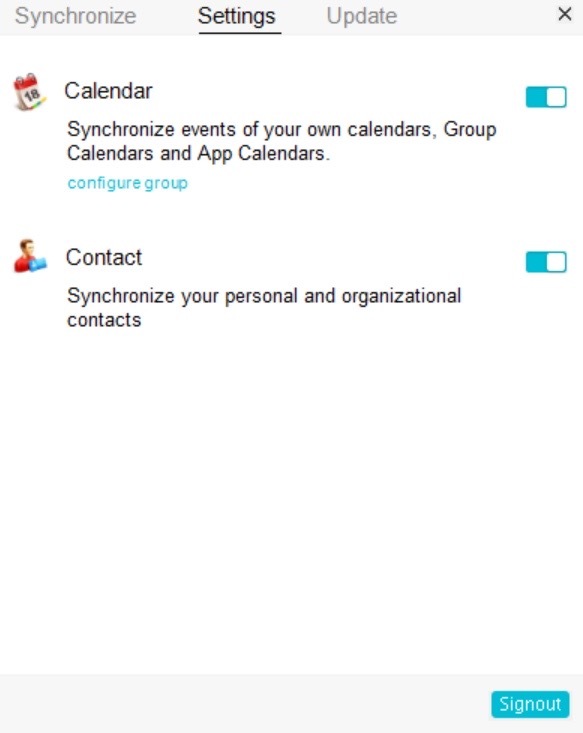 You can choose to sync both calendar and contacts or even one of them. You can select the Sync settings individually for Contacts/ Calendar, from the Settings dialog. 4. Click 'Configure group' to sync your group calendars with Outlook and select the groups for which the calendars should be synced. 5. 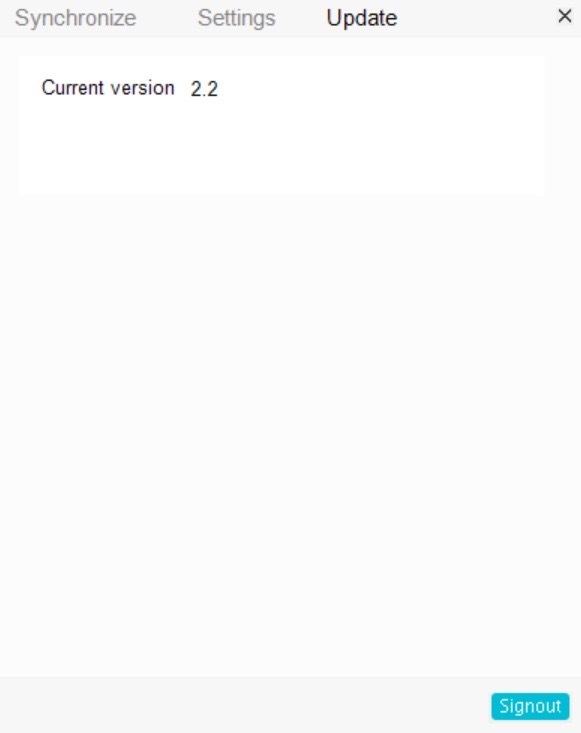 The Update tab shows the current version of the plugin and gets auto-updated when there is a new version available. 6. 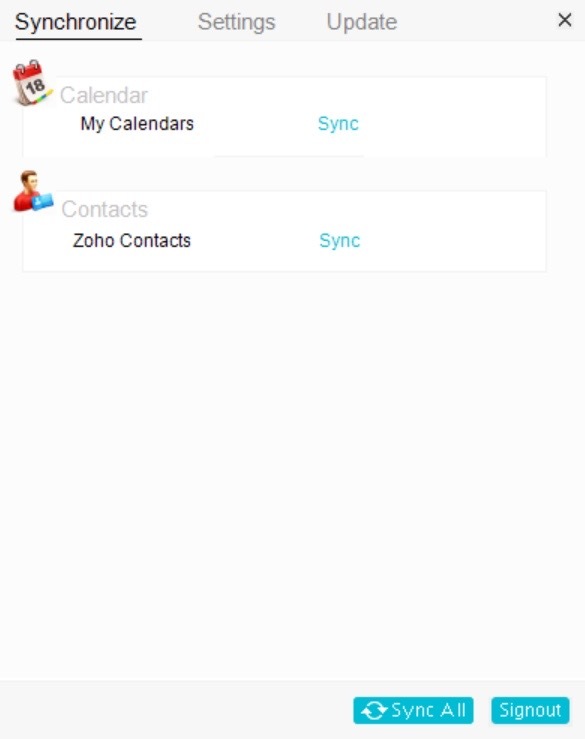 Click on the Sync button in the Synchronize section or use the Sync all button to sync both Calendar and Contacts. 7. This will sync your Calendars and the events in the respective Zoho calendars and Outlook. Zoho Calendar Outlook Plugin is currently available only for Windows systems and is not compatible with Mac OS based devices. Attendee information will not be synced between applications. The Outlook Plugin sync is a one-one sync. 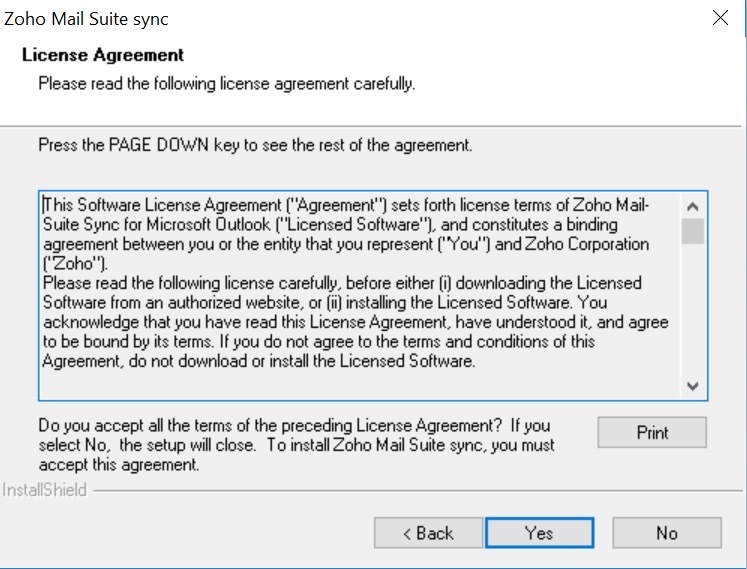 Once you choose a profile in Outlook, you will be allowed to sync your Zoho Calendar only with the particular Outlook profile's Calendar. The Outlook Plugin for Calendar sync is supported only for the 2010 and 2013 versions of Microsoft Outlook. 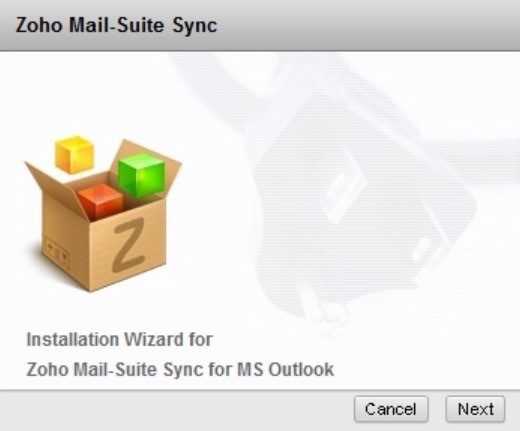 If you are unable to successfully initiate and complete Microsoft Outlook Sync using the Plugin, make sure you have downloaded the right version of the Plugin from Zoho Calendar. Microsoft Outlook Sync Plugins are available for both 32-bit and 64-bit versions of Outlook. Download the appropriate Plugin to complete the sync successfully. During Microsoft Outlook Sync using the Plugin, you might face multiple error messages. In such a case, uninstall and reinstall the appropriate version of the Plugin and start syncing. 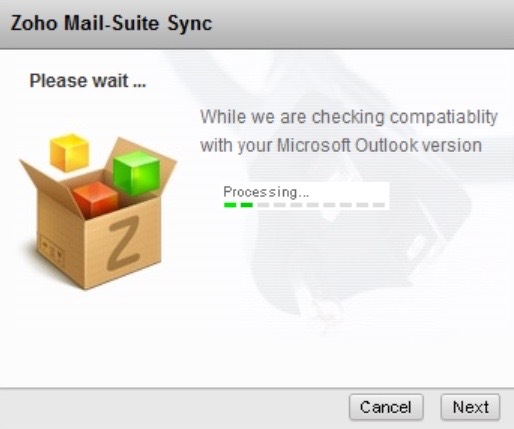 You might observe a good amount of delay when you are trying to sync your Microsoft Outlook calendar with Zoho Calendar. This usually happens when you are syncing the calendars for the first time due to large amount of data transfer. Once the sync is completed for the first time, you won't notice heavy delays during further synchronizations.